The first Orangery on the site was established in the middle of the fifteenth century, behind a stone wail at the edge of the moat separating the south side of the Royal Garden from the hill on which the medieval castle stands. Having been protected from strong winds and exposed to maximum sunshine, the orange trees managed to survive in relatively primitive1 conditions up until the First World War, when through lack of care the trees died. After the Second World War attempts were made to reuse the area for plants and trees. A simple greenhouse with a glass roof was erected, but this slowly deteriorated and eventually disintegrated in the summer of 1996. EJA were invited to make a proposal for a new enclosure of a similar size that would maintain the historical function of the site yet introduce the architectural language of the twentieth century.After several alternatives with sloping, flat or pitched roofs had been explored, a diagonal stainless steel mesh solution was selected, in agreement with the client, to support a suspended glass sheil. Initially, the front wall of the Orangery, rebuilt in 1947, was to be preserved, but since it had no proper foundations and its construction, in the post-war period, was unreliable, the decision was taken to demolish it but keep its 'footprint' in the paving of the new enclosure. The greenhouse has three main compartments - the first for decorative plants and trees, the second for plants recovering after a period in the castle itself, and the third for the cultivation of new plants. Each area has its own climate control and special facilities for the handling of different plants. In section the Orangery appears to be part of a circle framed by a diagonal mesh of 48mm-diameter tubes which meet at right angles.The structure is formed by welded crosses, connected by a mechanical fixed node formed from four solid ends.The tubes are clamped together, with top and bottom clamp plates held together by a single screw.The bottom part of the node holds a bracket from which the four corners of the toughened laminated glass panels are suspended; the individual sheets of glass are then connected with clear silicone. 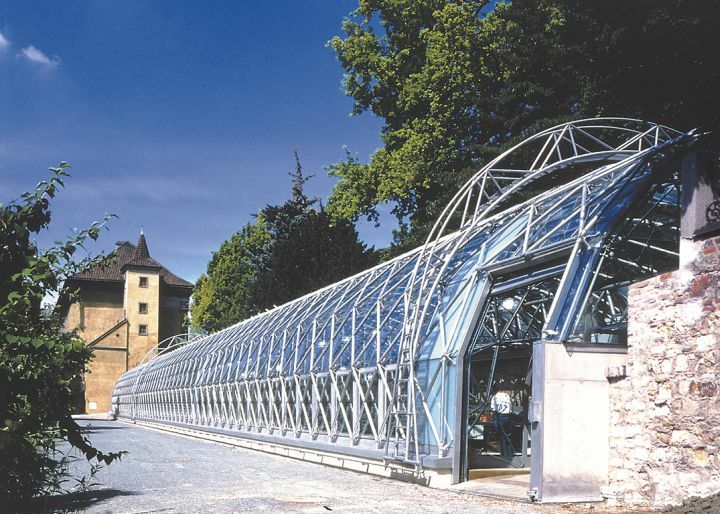 Glass and metal cross- walls stabilise the mesh, which is supported at the back (parallel to the retaining wall of the Royal Garden) by a triangular space- frame accommodating both the horizontal and vertical forces of the enclosure. On the inside of the glass shell, roller blinds provide shading in summer and insulation in winter. Heating pipes are situated under the blinds (to prevent condensation in winter), in the floor slab and along the back of the brick retaining wall. Other pipes suspended from the structure are for introducing vapour spray. Maintenance is carried out from an arch-like gantry that moves along the length of the building on two rails.